There is a narrative about the halcyon period in China from when Mao assumed power in 1949 through late 1956 when he launched what turned out to be the insidious “Let 100 flowers bloom” campaign. These were the good years when women were liberated and the nation’s new leaders seemed reform-minded and effective. The bad stuff all came later. In a scathing new book, The Tragedy of Liberation: A History of the Chinese Revolution, 1945-57, Frank Dikotter, a harsh critic of Mao in his earlier book on the Great Leap Forward’s unnecessary famine, demolishes the myth of Mao’s golden years. He maintains instead that was a time of unimaginable cruelty and wanton murder. I haven’t read the book yet, but recommend you read the review of the book in the Economist. These were years drowned in bloodshed. The genius of communist violence was to implicate ever more people in it. After landlords were tried in front of village tribunals, then beaten and shot, land and possessions were divided up among the crowd. It was an incentive to find new victims, many of whom were burned or buried alive. But the more victims, the greater the fear of reprisals from distraught families. So the tribunals kept on killing. Children were not spared. By the end of 1952 up to 2m Chinese had been murdered. A parallel terror was waged against those deemed to be counter-revolutionaries, Nationalists or foreign spies, some as young as eight, with new victims trucked daily to execution sites. Throughout these orgies of violence, Mao and other leaders coolly laid down quotas—up to four deaths for every thousand Chinese was considered appropriate. In the three provinces under the jurisdiction of Deng Xiaoping, known today for having been open-minded, 150,000 had been executed by November 1951. The total number of deaths will never be known. But in late 1952 Bo Yibo (father of Bo Xilai, whose recent trial has caused a sensation) said, approvingly, that 2m had been executed. Not everyone could be killed, Mao acknowledged. So a vast gulag was born, swallowing up counter-revolutionaries, vagabonds, prostitutes, capitalists, marketeers, foreigners and, later, intellectuals. The population in the “reform through labour” camps quickly reached about 2m. The relentless indoctrination, one inmate later said, was nothing less than the “physical and mental liquidation of oneself”. The country was, as Mr Dikotter puts it, well down “the road to serfdom”—literally so for farmers. All the landlord blood spilled was supposed to empower peasants. But the upheaval had devastated the countryside. Draught animals, fertiliser and skills were in short supply. The markets and other networks on which farmers had long depended were destroyed. Farming risked being branded the work of the evil landlord, yet the state demanded ever more grain from farmers in tax. Hardships multiplied. Villagers sold their children. I realize that Chinese people don’t like to hear foreigners say negative things about Mao. It’s a topic of great sensitivity, as I myself learned the hard way when I tried to discuss it with a co-worker some years ago. But the story needs to be told anyway. They aren’t going to read about it in Chinese textbooks so I am grateful to scholars like Dikotter for making sure that anyone interested can learn the truth. Again, since I haven’t read the book I can’t say it’s all gospel truth. But based on the review, it sounds like a good and important read. I admit, I’ve been sucked into the “halcyon years” myth myself. It’s good to see it debunked. Couldn’t agree more. My mom as a 6 year old saw their family dogs beaten to death in front of her eyes as they were marched out of their family estate. Loyalty can be a deadly trait for man’s best friend. My mom’s family turned over all the money they had to the government so her grandparents were spared execution…they were saved and released from death row in prison after more money came through from a bank in Hong Kong they had bought insurance from. The daughter in law of another landlord family in the village who managed all the finances for her family was not so lucky…she had her breasts skewered in barbed wired and was marched through town before being executed. I realize that Chinese people don’t like to hear foreigners say negative things about Mao. It’s a topic of great sensitivity, as I myself learned the hard way when I tried to discuss it with a co-worker some years ago. I think that’s true for Chinese people who have never left their country and may not even access foreign-language websites. Some considerateness is in order there. But to hell with “sensitivity” in an international discussion, Richard. This is the counterpoint to Dikotter’s short Age of Openness: China before Mao. Just like the monkey biting baby’s testicle story on BJC, you could just see excerpts of Dikotter’s review incoming from about two miles away before finding a home above. Dikotter produces good racy history with all the right evidentiary anecdotes just like Antony Beevor. Like Schell and Delury’s Wealth and Power – which is an easy and none-too-demanding read – why bother with an excerpt plus a bit of mea culpa commentary when, with a bit of effort you could kindle it, or heaven forbid, take it out of a library. To be sure it will be read by about three people on the Mainland, but they probably won’t need a copy since the whole Maoist epoch will have touched (in a most negative and cruel way) most families lineages. Its probably about memory and forgetfulness at two levels- the personal because its so bloody painful to dredge up and this quite suits the larger level of Party narrative. Murder in the name of equality has been the core value of leftist revolutions since the French Revolution. Like in the American Revolution? And yes, thank God when it’s the right staging the revolution, like Pinochet in Chile or the Myanmar army’s coup or Juan Peron in Argentina, there is only joy and love. Indeed. If Mao really was all that great, then the subject of his wrong-doings wouldn’t be “sensitive”, it would be an easy topic to discuss since the case for ‘greatness’ would be so easy to make. I’ve come to think that personality cults can create an entirely artificial image of ‘greatness’, which the victims will continue to sustain themselves even after the totalitarian regime falls through an all-too-human desire not to admit that they were cruelly duped. I’ve just got back from three weeks driving around the Balkans. It was striking how, in Albania, whilst evidence of the total insanity of Enver Hoxha’s policies was all around you in the ruins of heavy industry and bunkers whose construction was a total waste, the personality cult he set up was perpetuated in street-names, statues and so-forth. When you consider the case of Hoxha, you see that talk of the personality cults of Stalin, Mao, and the Kims coming from something particular in the cultures of Russia, China, and Korea, is nonsense. Implement the same totalitarian brain-washing in any country and you would get the same result – including a personality cult that survives even the collapse of the regime. Only the kind of total exposure that the regimes of Hitler and the Ceaucescu’s can counter it, and then only partially. PS – Juan Peron “right wing”? I think you’re talking about the military regime that came after him. You’re right about Juan Peron – can’t really call him “right wing.” But I do compare him with fascist dictators. I wonder when it will be time for “total exposure” in China. I’m not holding my breath. I’m not a great fan of revolutions and military governments, full stop. But the American Revolution is very much included in that – murder in the name of equality was far from being an unknown on those shores. Several of my ancestors on my mother’s side (the ‘Doan Outlaws’) were shot in the street or lynched for aiding the British. On my father’s side, they essentially lost their lands and their home for being Quakers and refusing to fight. And I’m just a white guy – God only knows what horror stories the Iroquois or the descendants of black men who were taken as POWs must have of the American Revolution. As Gil is quite right to note, historical whitewashing of venerated regimes and leaders is not the sole domain of the Russians, the Chinese or the Koreans. Blood was shed after the Revolutionary War, but no reign of terror as in France and Russia and China, at least not that I know of..
Just how do you categorise the very long history of lynching’s, live mutilations etc plus Jim Crow legislation from the Reconstruction period to the late 1960s. About two steps short of Nazi genocide. You are particularly blind when it comes to the US, Richard. Totally misunderstood me tubb. Simply saying the US revolutionary war wasn’t followed by a reign of mass terror with thousands randomly slaughtered that compares with Mao’s terror. Are you confusing that with the civil war? And watch your tone. And let’s get back to the topic of Mao. I will watch my tone from now on, while assuring you that my grasp of US history is pretty okay, in that it was Manifest Destiny for whites only and totally excluded Indians, Mexicans, African Americans and imported Chinese. That Mao was a total political sob goes without saying, yet his legacy today is even more interesting and just dripping with irony. I know all about those aspects of US history, but they aren’t relevant to my simple point, that not all revolutions need be immediately followed by bloodbaths as we saw in Mao’s China and Lenin’s/Stalin’s Russia and Pinochet’s Chile. Mao’s bloodbath was in part based on quotas — he wanted a certain number of “counter-revolutionaries” murdered on a regular basis. A pity many of the arrests and murders were random and many innocents died so Mao could meet his quotas. Similar quotas were imposed by Stalin. I totally agree with you Richard. Annnie Applebaum makes that point very clearly re Stalin’s Russia. Pinochet’s Chile did not fit into the quota scheme, and furthermore the figures are small beer (except for those on the receiving end) in comparative terms. Total population about 12.5 million. I never said Pinochet had quotas; he didn’t. Next topic. I can’t help but feel that Dikotter is out to “get” Mao: I read Mao’s Great Famine, and I never saw any irrefutable proof that Mao was completely responsible for the deaths. If anything, the Party was shown to be anabashedly culpable due to its fear of Mao, swaggering arrogance and slavish devotion to numbers. That being said, there is a great deal of evidence to to show that Mao was a monster. Dikotter just never provided it. Not every revolution needs to be followed by a bloodbath. But it is certainly a difference if a revolution starts in a place with a huge hinterland to where conflicts may be shifted and diluted, or if it happens in a densely-populated place with no way out for the “outlaws”, “outsiders” or those who don’t fit into the mainstream. I think KT made a good point. Too much emphasis on “tone” isn’t helpful, in my view. Thanks, KT and justrecently – I know we’ve had our disagreements in the past, but I appreciate the assist on this one. Richard, I’m really not sure why you are downplaying the experience of black people and Indians in your treatment of the American Revolution. The Iroquois (minus the Oneida) and several other American Indian tribes opposed the Revolution, and were therefore treated for decades – arguably a century or more – afterwards as enemies of the state, completely without legal or human rights. All such revolutions foist their problems off on scapegoats. True, no quotas were imposed on how many Indians were to be killed, and also true that even in the evils of revolution there is degree, but that is a pretty big leap of the goalposts back from ‘no murder in the name of equality’. I do happen to agree with narsfweasels here, though. Again, I’m nowhere near anything like a fan of Mao (indeed, I tend to think the entire lot of political leaders China has had to endure since the Qing Dynasty fell have been utter bastards – the possible exception being Jiang Jingguo in Taiwan), but just from what I have read from my Chinese history classes of Dikötter’s main narrative in his previous books, it distorts Mao’s role, and tries to finger him as personally responsible even when the more trenchant critique would be how the social chaos Mao set in motion spiralled out of his personal control. I don’t think Mao’s greatest crime was murdering his citizens. His greatest crime was getting his citizens to turn on and murder each other, by dissolving all of the natural bonds between family, between friends, between teacher and student, and generally rewriting the rules of the society. And he’s not responsible only for the atrocities committed in the name of achieving his ideal, but for the failure of that ideal itself. #21 “Again, since I haven’t read the book I can’t say it’s all gospel truth”. The main text. The endnotes and the bibliographical resources. Mao was essentially trying to become emperor of China. And Mao wanted to create a China molded in his image of China. Mao often cited Chinese history as the sources of his vision for China. Socialism was an excuse for his mandates from heaven. In the post WWII period Mao needed Soviet backing to implement his visions. But Mao chafed at the idea of having to kowtow to the soviets. So Mao decided to show that China could do better at Socialism than the Russians. This ended in the disaster of the Great Leap Forward. Mao may have thought of himself as the Son of Heaven, but in the end the Communist party had enough of his cult of personality. Interestingly Bo Xilai tried to follow in Mao’s footsteps. And now Xi Jinping seems to have taken to following in Bo’s footsteps. Xi seems to be setting up a Maoist type of rulership. Xi has solidified his PLA credentials. Xi has been going after his political enemies and charging them with corruption (like Bo did in Chongqing) and Xi is cracking down on Internet freedoms on Weibo and other web sites, with new Internet laws. These latest crackdowns remind me of Mao’s anti rightest campaign. And now Xi is being shown in pictures with Mao. Bo gets sentenced this weekend. The Qincheng Big House. Probably not. 20 years more than likely. Xi. Go back to my link on # 14. That to me is kind of proof that he didn’t care – not malicious, but that those who died were simply unimportant. I wouldn’t trust Chang and Halliday’s selectively quotation. In this kind of situation, I think if we do half of China’s population unquestionably will die; and if it’s not a half, it’ll be a third or ten percent, a death toll of 50 million. When people died in Guangxi, wasn’t Chen Manyuan dismissed? If with a death toll of 50 million, you didn’t lose your jobs, I at least should lose mine; [whether I would lose my] head would be open to question. Anhui wants to do so many things, it’s quite all right to do a lot, but make it a principle to have no deaths. I don’t always agree with Dikotter but I doubt he is simply making this up. That would be to put all his credibility on the line. BBC has just done a tremendous Dikotter interview, where he also notes that Deng Xiaoping was pretty keen on increasing the quota. Also good stuff on the sources he has used, namely Party documentation. There seems to be a deep longing in some people to view Mao as “complex”, “multi-faceted” or “intriguing” instead of seeing him as the simple butcher that he was. In my opinion, whether he acted out of malice, hubris or ignorance is secondary (it was most likely a combination). What historians should focus on is how he managed to come to power and how to stay there. Why did the peasants, a rebellious lot who had fought in the civil war, turn in their farm tools to be used as iron ore without murmur? Why did Peng Dehuai not simply overthrow Mao in 1959 when he commanded the army? Why did children turn against their parents and students against their teachers with such ease in 1966? Who, on the other hand, stayed humane in these dark years? Was there a Carl v. Ossietzky or a Dietrich Bonhoeffer in Mao’s China? Tanks – China: 0. USA: 149. Armored vehicles – China: 0 . USA 35. Artillery: China 66. USA: 300. Mobile rocket launchers: China: 27. USA: 550. When a weak nation is invaded by a stronger one, that the weak can resist with all its might until the last breath is already an heroic feat. For a weak nation to challenge a strong one by going outside of her own borders, that had never been tried before. 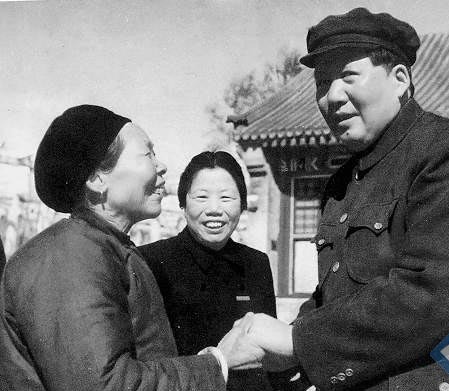 When Mao shook hand with the mother of Huang Jiguang, another PLA soldier who gave his life in Korea, we saw no sadness on the mother’s face, only smiles. Why? Because she knew. She knew that of the arsenal of heroes who were forever resting on that battlefield, her son was among them, but so was Mao Zedong’s. The person now shaking her hands and sending his condolenscnes, was also a family of the war hero. From this mother we saw a spirit larger than life, a spirit of fearlessness, a spirit of sacrifice, a spirit of idealism, a spirit of a hero, a spirit of a mother. Those are also the spirits of Mao. Mao belongs to China, but he also belongs to the world. He is of the Chinese people, but also of the world’s people. Clock, could you please stop re-posting the same old garbage comments? They were rubbish the first time round, and they’re rancid now.